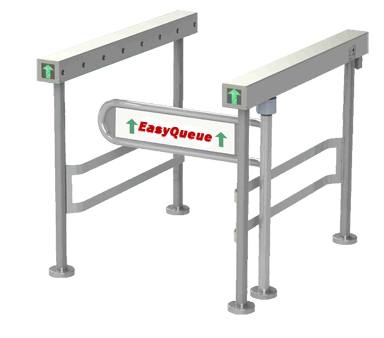 Gallery Metalworks simplified handicap rail systems are assembled on site to your specification. 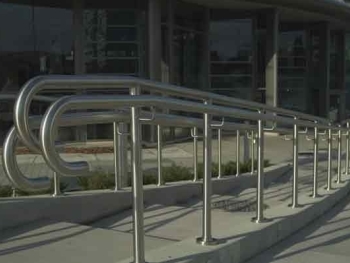 Our unique fittings give you flexibility and versatility in the design of your handicap handrail. In a typical scenario, you will provide our team with a drawing or stick sketch of your site plan. We will provide you with a quote for all the fittings and tubing that are required to assemble your handicap handrail. You, your maintenance team, or general contractor can simply install the railing on site. Shipping is easy and packed in K-D form (knock down) for quick picking, packing, cost efficiency and shipping, assembly on site. Handicap rails by strict building code are generally specified in double horizontal rails at 36” and 42 “from the ground. They are also often required on both sides of a hall or passageway and in the case of an extra wide entranceway also down the center.